If you couldn’t tell from What I’ve Done, I had a new idea every hour of every day. Until now, I haven’t really found a way to organize and develope my ideas. Thankfully, Elevatr is here to save the day! Serial entrepreneur will love this new mobile app called Elevatr, which helps you keep track of your inspirations, as well as develop a business model, in order to turn your passing thoughts into plans actually worth pursuing some day. The beautifully designed app was dreamt up by New York-based David Spiro (one of my closest friends and past business partners), a recent college of engineering and business school grad from the University of Michigan. We spent all our time outside the classroom learning through standard tools for business model development, including the Business Model Canvas and Lean Canvas. After the two of us decided to end development on our most recent collaboration, Spiro finally decided to commit himself to the creation of Elevatr full-time, after first doing some consulting for a local angel following graduation in spring 2012. By this January, he had an MVP (aka Minimum Viable Product) ready to go after contracting with Fueled, a mobile app development agency in Soho that had previously built apps for JackThreads and Urban Daddy. David now works out of Fueled’s offices, and has hired a small team (with help from AngelList), including CTO Rafael Amorim. The product itself is simple. Elevatr is essentially a note-taking app that takes the structure of a traditional business plan and makes it more accessible to design and develop on the smaller screen of mobile devices. After tapping the button to add your idea, the app prompts you to describe the idea in 140 characters or fewer, just like Twitter. On the following screens, you’re walked through the other standard pieces to business-model creation, filling out details as to the target market, market size, competition, differentiation, features and uses, and so on. There’s also plenty of room for free-form note making in Elevatr, so you can really flesh out your ideas and plans. At launch, the app is designed for personal use, but the team already has the intention to expand its capabilities in the near future. Next week, an option to export your ideas to a responsive website will be introduced, essentially turning your notes into a more fully developed online deck of sorts that you can share with others in order to get feedback. In addition, collaboration will be built into the app, which will allow you to invite others to view or comment on the content, given their permission levels. 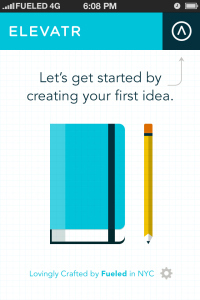 Another idea for future expansion is to partner with other companies – agencies like Fueled, for example – giving them access to an administrative interface that would allow them to leverage the service to sort through a larger group of startup ideas, like those submitted as part of a contest, for instance. That, and some other advanced features, may be paid options in the future, but currently the app itself is a free download here on iTunes. Elevatr has a small amount of friends and family funding, but is now raising an angel round upwards of $500,000. I use wordpress and haven’t really had any issues. Sorry I can’t help more.. Good luck!